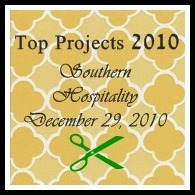 The lovely Rhoda at Southern Hospitality is hosting a Top Projects 2010 par-tay so I thought I would recap the Top 10 of SNM for you here. 1. The Red Painted Trophies. This seemed to be a favorite of the SNM readers. Easy, cheap, and made an impact. 2. The Big Boy Bed. Even though when I try to exit out of the bed at 11:30 p.m. and try NOT to wake Grand Slam due to the squeaking, I really love how this bed turned out with the red paint. Again, cheap, somewhat time consuming, yet impactful. 3. Painted cheap-*ss file cabinet. Free except for the knobs. I mean, seriously...anyone can do this. In addition, it annoys me less. That's a bonus! 4. Barrettes Holder Frame. Easy. Seems to be a hot commodity based on what folks search for here at SNM. I made another for my niece Hope that took me about 8 months, but it was because I improvised...and failed. 5. Gallery Wall. Done on a moments notice and still needs to be tweaked. I don't want to rush it. However, it does bug me. Reminds me of the four other gallery type walls about which I could post. 6. Guest Room Dresser. Fun. I like this one. I think it is hard to tell the difference in the photos, but I really love the light greenish color and the knobs. 7. Kitchen Hardware. I didn't really do the heavy lifting on this one beside ordering all the knobs, returning the rejects, and then still wondering if I made the right decision. Trust me, I still debate over whether or not I picked the right hardware. 8. Bench Redo. Easy. Cheap ($45). But I sometimes look at it and think I could add a little more depth to it. 9. Louis Chair Redo I sort of feel the same way with the chair as I do the bench. It doesn't seem finished to me. I am thinking about adding a little more gray and distressing. Yeah? 10. IKEA Lazy Susan Hack So easy I could have done this pre-LASIK with my eyes closed. And, it has actually come in handy. Thanks to all of you who visited in 2010! It's been a fun year. Special thanks to my top commentors -- Angie, Beth, Jen, Jane & Sally!! Older PostEye Can See Clearly Now!